For comparability with other cities around the world, Bridgetown has been defined as the entire urban area from the Grantley Adams International Airport in the east to Holetown on the West Coast (Platinum Coast). This area takes in most of the parish of St. Michael, the coastal section of the parish of Christ Church, the south-western corner of the parish of St. Thomas and the southern part of the parish of St. James. Of the names of the 181 suburbs and neighbourhoods that have been identified to date in Greater Bridgetown, 46 (25.4%) can be found in Scotland or are based on Scottish family names. Of course, many of the names are used in other parts of the British Isles as well, but at least 18 of them (10.0%) are unique to Scotland, or are readily identifiable with places in Scotland that are based on the same names. 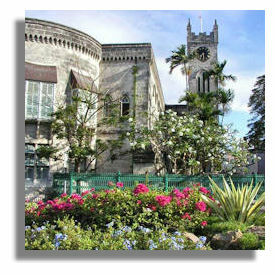 Picture of a Bridgetown building via Wikimedia. Arthurs Seat (mound in Edinburgh, associated with the legendary King Arthur). Bannatyne - a Scottish family name. The Bannatynes are septs of Clan Campbell of Argyll and Clan Stuart of Bute. According to Black (1996), the authority on Scottish family names, the origin of this name is a place called Bennachtain, which no longer seems to exist. Bannatyne is an old name, going back to the 12th century. Callendar (Callendar House and Callendar Park in Falkirk). Callendar House (pictured here) is considered to be one of Scotland's finest country houses, steeped in 600 years of Scottish history. William de Livingston built the original Tower House in 1345, his descendants occupying the Callendar estates until 1747. Grand View (Shetland Islands, spelt Grandview). Grand View/Grandview was a popular name for neighbourhoods as well as streets in all English-speaking countries during the nineteenth and early twentieth centuries. In most instances, the name was applied to localities that literally afforded a wide panorama. In all probability, this was also the reason for the naming of this outlying suburb as well as the locality in Scotland. Graeme Hall, Graeme Hall Park and Graeme Hall Terrace - there is a Graemeshall in the Orkney Islands, Graeme being a variant spelling of the Scottish family name Graham. Two branches of the Grahams (that's the Graham of Montrose tartan here) borrowed the spelling from George Buchanan's (1506-1582) history "Rerum Scoticarum", Graeme being mentioned as the legendary leader of the Scots at the breaching of the Roman-constructed Antonine Wall between the Firths of Forth and Clyde. Inch Marlowe (Aberdeenshire, spelt Inchmarlo). Maxwell, Maxwell Coast and Maxwell Hill - there is a Maxwellheugh in the Scottish Borders, Maxwellbank, Maxwellfield and Maxwelltown in Dumfries & Galloway, Maxwell Park Station in Glasgow and Maxwellston Hill in South Ayrshire. The Maxwells, descended from Maccus, the son of a Saxon lord, became the wealthiest and most powerful family in Dumfriesshire and were depended upon, after the fall of the Black Douglases in the 15th century, to maintain law and order along the border with England. The name derives from a place called "Maccus's Wiel" (Old English 'wael' - a pool or whirlpool). Montrose (Angus). One of the reasons for the popularity of the name Montrose throughout the English-speaking world may have to do with Sir Walter Scott's novel The Legend of Montrose, published in 1819. Alternatively, the name could commemorate the Duke of Montrose. Neils - there are many places in Scotland based on the Scottish surname of Neil. The list includes Neilsbrae in Aberdeenshire; Neilston, Neilston House, Neilston Pad and Neilstonside in East Renfrewshire; Neil's Helly in the Orkney Islands; and Neilshill Farm and House in South Ayrshire. Rouen - there is a Rouen Bay in Aberdeenshire, north of Inverbervie. Rouen, of course, is also an important city in Normandy, France, which suggests that the connection might not necessarily be with Scotland. Sargeants - there is a place called Sargeantlaw in Renfrewshire, near Gleniffer Braes. Black (1996) does not list Sargeant as a Scottish name, but Sergeant is found from 1200. Strathclyde – the region of SW Scotland through which the river Clyde flows, including the Greater Glasgow area. Silver Sands - there is a Silversands Bay in Fife to the east of Aberdour on the Firth of Forth (see illustration below). In the case of Bridgetown, the name may be purely descriptive. Appleby (Dumfries & Galloway) but far more likely to be of English origin. Balls - there is a Ballfield Plantation in Fife and a Ball Hill in the Orkney Islands, but places with Ball as an element in the name are very numerous in south-western England, especially Devon and Somerset. Belmont (Scottish Borders, Shetland Islands and South Ayrshire) also found in England, Ireland and Wales and was an extremely popular choice of name in all English-speaking countries during the nineteenth century. Black Rock (Argyll & Bute, Highland and the Orkney Islands) but just as common in England and is also found in Ireland and Wales. Carrington (Midlothian) also three places in England. Cave Hill (Scottish Borders) also in North Yorkshire, England. Club Morgan - although there is no such place name in Scotland, Morgan is a Scottish family name (that's the clan tartan shown here). However, it is a very common Welsh family name as well (Morganstown is a suburb of Cardiff in the former Welsh county of Glamorgan) and the name has also been taken to England, probably by the Welsh Morgans, e.g., Morgan's Hill in Wiltshire. One wonders whether the name of this community has any reference to Sir Henry Morgan, the seventeenth century Welsh buccaneer who was kidnapped and shipped to Barbados. Edge Hill (East Ayrshire) but found more frequently throughout England. Fairfield (Clackmannanshire, Shetland Islands and Stirling) but found even more commonly throughout England and is also found in Ireland. Durants – Durant is a Scottish, English or French family name. There appear to be two communities with this name in Greater Bridgetown, one in the parish of Christ Church and the other in the parish of St. James. Green Hill (Aberdeenshire, Angus, Scottish Borders, Dumfries & Galloway, East Ayrshire, Fife, Moray, North Ayrshire, Orkney Islands, Shetland Islands, South Ayrshire and South Lanarkshire) but Green Hill occurs even more commonly throughout England. Halls - there is a place in East Renfrewshire simply called Hall, as well as a place in Devon, England. The name of this Bridgetown community is far more likely to be of English rather than Scottish origin given that the surname Hall is the 20th most commonly encountered surname in England, according to the Wikipedia Encyclopedia. Henrys - places in Scotland with Henry as part of the name occur quite frequently (Henry's Scorth in Aberdeenshire, Henryton in East Ayrshire, Henry's Loch in the Shetland Islands and Henry's Hill in South Lanarkshire). It occurs less frequently in England and Wales. Highgate (Dumfries & Galloway and North Ayrshire) but far more commonly found in England and Wales. Husbands - there is a Husbandtown in Highland, as well as Husbands Bosworth in Leicestershire, central England. Jamestown Park - Although there is no Jamestown Park as such in Scotland, there are places called Jamestown in Aberdeenshire, Dumfries & Galloway, Fife, Highland and West Dunbartonshire. Jamestown also occurs fairly frequently in Ireland as well as in the USA and may refer to King James VI or VII (James I or II of England). In the case of Bridgetown, the name may perhaps refer to the saint since the neighbourhood is located in the parish of St James. Lodge Hill (Scottish Borders and South Lanarkshire) but far more commonly encountered throughout England. Lower Birneys - there is a Birneyknowe in the Scottish Borders, as well as Birney Hall and Birney Hill over the border in Northumberland. Newton and Newton Terrace - Newton is found in Aberdeenshire, Angus, Argyll & Bute, Scottish Borders, Dumfries & Galloway, Fife, Highland, Inverclyde, North Ayrshire, Midlothian, Moray, Orkney Islands, Perth & Kinross, Shetland Islands, Stirling, South Lanarkshire, West Lothian and Western Isles. There are also many other places such as Newton Mearns in East Renfrewshire, Newton of Ardtoe in Highland, Newton of Balcormo in Fife, etc. Newton is just as commonly found throughout England and, to a lesser extent, Wales. There are in fact very few counties in the whole of Britain which do not have at least one Newton. Surprisingly, the name is not used in Ireland. Paradise Heights - there are places in Aberdeenshire and Fife called Paradise, as well as seven places in English cities and counties. The name of this Platinum Coast community is likely to be purely descriptive of an idyllic location. Seaview (Highland) also two places in England. Silver Hill (Dumfries & Galloway and Highland) also in five English counties. Spencers - there is a Spencerfield in Fife, but Spencer is encountered far more frequently in England, including a place actually called Spencers in Essex. Spring Garden (South Ayrshire) also in East Sussex, spelt Spring-garden. St Davids (Fife and Perth & Kinross) however St Davids occurs throughout England as well. It is also the name of the cathedral city in Pembrokeshire, Wales, which honours the patron saint of Wales. Whitepark (Dumfries & Galloway) also Whitepark Farm in Essex, England. Scottish place names are also found in other parts of the island of Barbados. Obvious examples include Bairds, Carmichael, Castle Grant, Christie, Cleland, Douglas, Moncrieffe, Sterling and Sutherland Road. Names of English origin dominate, however, making both Bridgetown and the whole island of Barbados one of the most heavily English-influenced parts of the former British Empire. It may interest readers to learn that Bridgetown is one of only a handful of cities in the former British colonies that has no indigenous place names. This is because Barbados was completely uninhabited when the British landed there in the early seventeenth century, though signs of earlier habitation were subsequently uncovered. Readers interested in learning more about the subject of Scottish emigration to Barbados, particularly during the 17th and 18th centuries, would find the following publication highly relevant: "Barbados and Scotland, Links 1627-1877", by David Dobson, available from the Genealogical Publishing Company and Clearfield Company, Baltimore, Maryland ( www.genealogical.com ). This book, published in 2005, is of special significance to genealogists since Barbados was the springboard for the settlement of other British colonies such as Jamaica and South Carolina. Scarlett, James D. (1975). The Tartans of the Scottish Clans. (Collins, Glasgow and London). Black, George F. (1996). The Surnames of Scotland. (Birlinn Ltd, Edinburgh). Thorne, J.O. & Collocott, T.C. (Editors) (1974). Chambers Biographical Dictionary (Revised Edition). (W & R Chambers, Edinburgh). Barbados Road Map, 1995 (Berndtson & Berndtson Publication OHG, Fürstenfeldbruck, Germany). Websites, place name gazetteers and published Ordnance Survey maps of British and Irish cities, towns, villages and counties. If you wish to contact Ian about his research, his e-mail address is ian.kendall1@bigpond.com.